Victor Paul “Vic” Donahue was born in Philadelphia, Pennsylvania, on August 28, 1918. The birthplace is from Donahue’s brief biography at AskArt.com and the birth date is from the Social Security Death Index which also had his full name. In the 1920 U.S. Federal Census, Donahue was the youngest of two children born to William and Fern who would be recorded as May in later censuses. Donahue’s father operated a sheet metal business. The family resided in Philadelphia at 569 Herman Street. Maywood, Illinois was the hometown of the Donahue family in the 1930 census. They lived at 320 Lake Street where Donahue was the second of three children, whose father was an automobile mechanic. Some time later the family moved again. According to the 1940 census, the Donahues were residents of Omaha, Nebraska. Their address was 1330 South 26 Street. 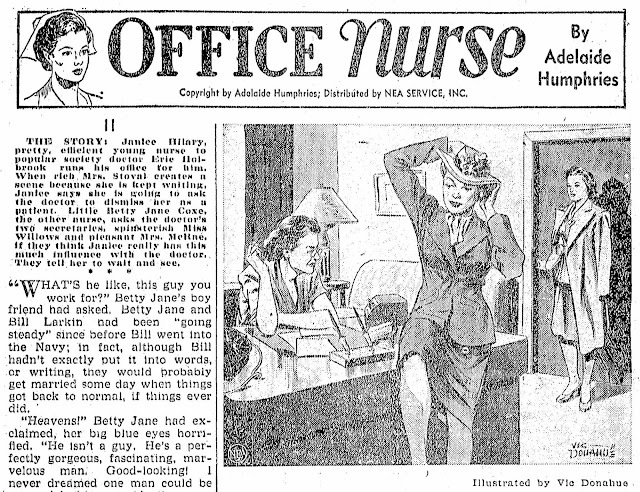 In the occupation column, Donahue was a “new worker”. 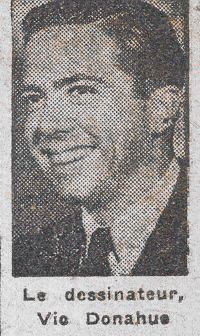 The Omaha World-Herald, October 5, 1969, said Donahue graduated from Technical High School in 1937. (One of his teachers was Anna Myers who became head of the art department in 1939, according to World-Herald, June 7, 1951.) Donahue, who never attended art school, had a year at the University of Omaha. 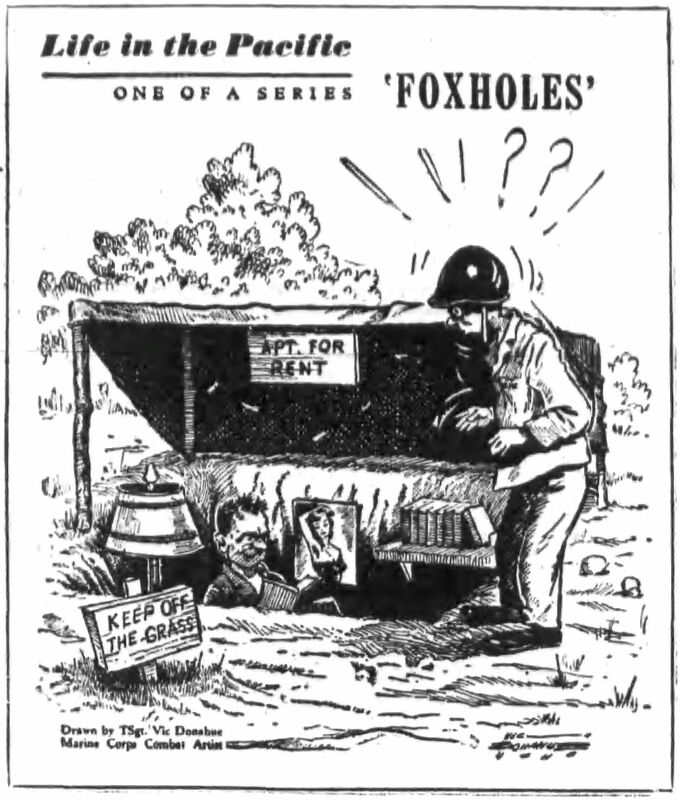 He drew sports cartoons in Chicago for weeklies and joined the World-Herald in 1938. During World War II, Donahue served in the Marine Corps. T/Sgt. Victor P. Donahue, born 1918 in Philadelphia, enlisted in the Marine Corps January 1942. He was trained for the Marines on the West Coast and qualified as a marksman with both pistol and rifle. Previously, he had been doing sketches for an Omaha, Nebraska newspaper [World-Herald], as well as some commercial art work. In his spare time, he was a drummer with a swing orchestra which toured Nebraska and neighboring States. He was originally classified as a musician in the Corps. His drawings, however, brought him to the attention of Marine authorities and he was eventually reassigned to the Division of Public Relations as a combat artist. Today he is with a combat unit in the Southwest Pacific. 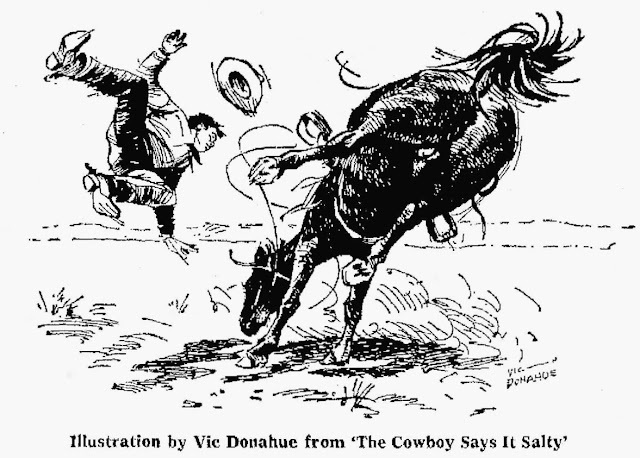 The press release described two of four drawings by Donahue. Donahue’s art was published in the Marine Corps Chevron June 10, 1944 and February 3, 1945. The cover of Liberty, July 7, 1945, featured Donahue’s illustration of a Marine plugging his ears as a string of firecrackers explode. Donahue provided the art for a 1945 Marine Corps recruitment poster. The World-Herald, February 23, 1947, named him as one of the contributors to Semper Fidelis: The U.S. Marines in the Pacific 1942–1945. American Newspaper Comics (2012) said Donahue produce material for the Newspaper Enterprise Association. Wings of Tomorrow—The Story of Aviation ran from October 28 to November 9, 1946; it was written by Charles Tracy. Trip to the Moon and Back appeared February 10 to 15, 1947. India, Background for Freedom also had a short run from August 11 to 16, 1947. The World-Herald said Donahue left the NEA in 1948 and freelanced for comic book publishers Fawcett Publications, Harvey and others. He was also a member of the Simon and Kirby Studio. Donahue relocated to New York City where he worked as an advertising, book and magazine illustrator. Later he moved to Arlington, Vermont where he lived for six years. In 1962, Donahue moved his family moved to Tucson, Arizona. The World-Herald said Donahue said Donahue was in the process of moving to Colorado Springs, Colorado in October 1969. It is not known how long he lived there. Donahue passed away December 16, 2008, in Arizona. He was laid to rest in the Southern Arizona Veterans Memorial Cemetery.